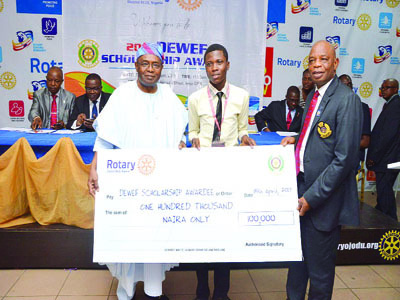 Eighteen indigent undergraduates have benefitted from scholarships value at N100 000 each, courtesy of Rotary District 9110. The beneficiaries were presented with their cheques by District 9110 Educational &Welfare Endowment Fund (DEWEF), which cut across Lagos and Ogun states, at Rotary House, GRA Ikeja, last week. DEWEF Chairman, Adeniji Raji, thanked one of the club leaders, Adekunle Kukoyi, who initiated DEWEF in 1992 to encourage poor, but brilliant undergraduates whose cumulate grade points hover between 3.6 and 4.2. Adeniji recalled that the award eventually kicked off in 2009-2010 with three awardees, adding that the nimber of beneficiaries have continued to increase with each edition. “As you continue your journey through college and into the wider society, be reminded always that each of you therefore, has a role to play to make Nigeria better,” he urged.